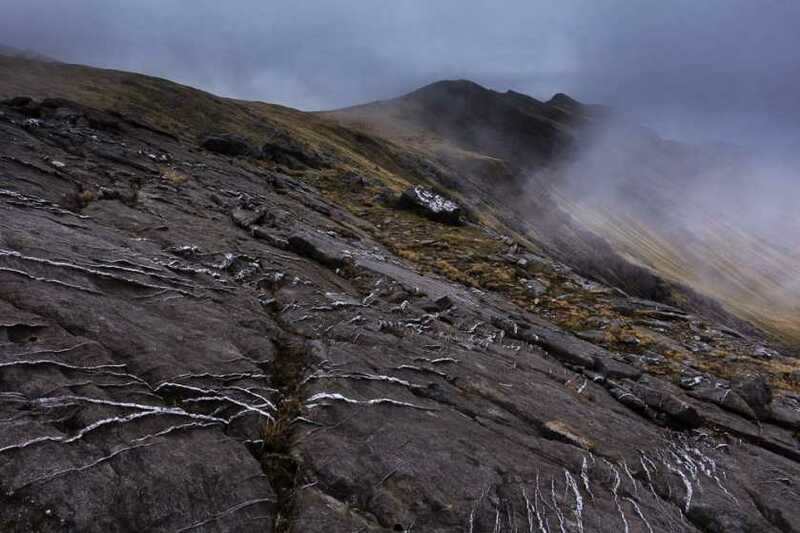 Picture from Aidy : Crossing from Ben Bury to Mweelrea as cloud closes in. Picture: Crossing from Ben Bury to Mweelrea as cloud closes in. I found Mweelrea to be a magnificent mountain, dramatic, rugged, and with amazing views. I would definitely recommend ascending from the Doo Lough side to take in the Ben Lugmore tops and Ben Bury to make the most of the scenery. Our walk did however serve as a reminder that the Irish mountains, particularly one such as Mweelrea, can be dangerous. I normally walk alone due to all the stop/starting and diversions for photographs, but this time I had two companions with me - both fit and healthy ( and much younger than me!). By the time we got to Ben Lugmore however, one of them was seriously struggling. I don't know if it was a fitness problem or if he was coming down with something, but he started to slow to a snail's pace, and began having severe pain in his legs. He wanted to push on, and it seemed to be a similar distance no matter which way we went at this stage, but progress was painfully slow, and by the time we got to Mweelrea he was in a bad way. All we could do was walk slowly with him, with plenty of stops, and I had already given him my hiking poles to see if that helped. We abandoned the idea of going over the SE Spur and Teevnabinnia, to get to flatter ground, but it became clear that we wouldn't be getting out before dark. As we reached the valley floor, aiming for a forest track which led out to the road, he was actually starting to hallucinate and shiver, even though the weather was extremely mild. Luckily, as I knew Mweelrea was a serious mountain I had spare warm clothes and a foil emergency blanket, and we sat and let him rest for a couple of hours, giving him plenty of water and high energy food. Eventually he recovered enough to undertake the last stretch, albeit extremely slowly, and we made our way out in darkness - again thankfully I had a GPS and torches. A reminder, that on a mountain like this, no matter how good the conditions, it is better to well prepared, and maybe to carry that little bit of extra gear. I have to admit, I always felt half embarrassed at carrying foil blankets etc in the little Irish mountains, but I'll always have one on me from now on!